The 'Two and a Half Men' star spent over $100,000 on a 2012 Lexus LS 600h hybrid-engine vehicle for his wife's birthday on November 9, just a week before she announced they were splitting last Thursday, amidst allegations he cheated on her, according to TMZ.com. Claims that Ashton had slept with 23-year-old Sara Leal on their sixth wedding anniversary in September rocked their marriage, but they were said to have tried therapy sessions in an attempt to save their union but Demi finally decided she couldn't forgive Ashton. It is not known if Demi, 49, accepted the gift, or if she gave it back to the car company. 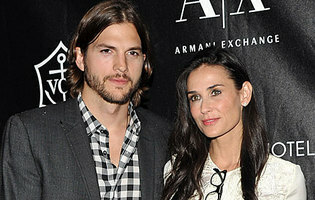 It was claimed yesterday that the 'Indecent Proposal' star has reportedly instructed lawyers to "punish" Ashton, 33, in their divorce. A source close to Demi said: "She is furious, raging in fact – you only have to look at every photo you see of her to see the toll Ashton's cheating has taken on her. "She wants to punish him financially because of the way he has broken her heart. She is going to give him a bitter fight and, whether or not she wins, it will be an expensive lesson for him." Although the couple have a prenuptial agreement, insisted on by Demi – who is thought to have assets of around £97 million – she is believed to be seeking part of Ashton's personal wealth accrued during their six-year marriage. The source added: "These agreements are designed to protect one's earnings during the marriage as well as one's pre-nuptial assets. "She is talking about going after a share of what he has earned since their marriage on the grounds that she contributed to much of what he has achieved."